Depending on your subscription plan, you can have more than one users in your company’s account in Elorus. Therefore, your staff or your accountant can access the organization’s data without having to exchange emails or hard-copies of documents. In order to manage your company’s users, select “Users & roles” found inside the Settings menu. Invite new users to the company. Change each user’s role and the roles new users will assume when accepting invitations. Delete existing users and invitations. The application supports 3 default user roles, “managers”, “staff” and “partners”. The staff does not have any access to user management and does not have the authority to add/remove users or alter the roles of existing ones. Also, staff users do not have access to subscription plans; therefore they cannot renew/alter current subscriptions or view payments history. In organization settings, the staff does not have the authority of altering company settings (e.g. contact details or selected themes) except for settings attached to their personal accounts (e.g. time zone, application language, personal contact details etc). 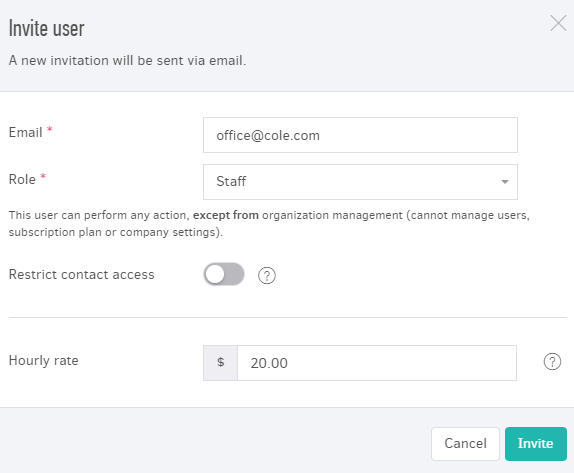 Finally, partners can only view each account’s data since they are not allowed to process or create new records, manage users or organization settings. > Each organization must always have at least one active manager. > Predefined roles cannot be modified. At Elorus you can define the access level of each user by creating the corresponding role. This will allow you to restrict access to specific menus and actions for some of your users. See the related article for instructions. To add a new user, you must click on the "Invite user" button inside the Settings -> Users & Roles menu. Choose their role in your organization. Specify to which contacts they will have access if you do not want them to see transactions for all your contacts by activating the "Restricted contact access" option. In the window that opens, type the contacts you want them to have access to. The hourly rate you wish (if applicable). This option is used by the Time tracking feature, so if you do not use it you do not have to fill in anything here. After pressing Invite, Elorus will send them an e-mail, and if they accept, they will be added to the list along with all the existing users and gain access to your data. Regardless of your subscription plan, you may send out unlimited invitations to prospect users. Given, however, that most plans have a limited number of users, in case you reach it, your invitations cannot be accepted unless you upgrade your subscription or remove some users from the list. Note: You can send up to 50 user invitations (all time). Should you need to exceed this limit, you can contact our support team to increase it. In order to delete a user, click on "Delete" button found on each user's row. If you want to change their role or restrict their access to specific contacts, you can click on "Edit". In case your organization is downgraded to a specific user limit, then some users may be disabled. Suppose an organization in the Professional plan with 3 users, one with the role of "manager" and 2 users as "staff". If the administrator chooses to downgrade the plan for next billing cycle to Basic (e.g., 1 month), which has a user limit of 2, the following will happen automatically: The administrator and the oldest user will remain active, while the newer one will be disabled and will not be able to access the organization. Let's assume that an organization is in the Basic plan with 2 users as managers and for some reason the subscription is not renewed, resulting in a downgrade to the free plan. The free plan allows access to one user and the one who will remain active in this case will be the administrator that was created first. In any case, in order to reactivate users, it will be necessary to upgrade to a paid plan with the corresponding user limit. The active manager should then manually activate those who were disabled by editing each of them and choosing "Active" from the relevant field.